Bhubaneswar: In a significant development, KIIT University has become the first private university in Odisha and the eastern India to enter into the prestigious QS BRICS University Rankings 2018, which was published on November 22, 2018. KIIT University has achieved ‘251 – 300’ rank in the ranking results. Ranked 8th among reputed private institutions in India, it is the youngest university in the country to figure in this prestigious ranking. KIIT has earned worldwide reputation despite being a young university of only 14 years and a young institute of 20 years. KIIT got accreditation from NAAC within only four years of being declared as a university. It is also accredited by National Board of Accreditation (NBA) in Tier 1 Format, recognized by Washington Accord, IET, UK and many other bodies. QS rankings are among the best-known and most respected in the world. It is compiled after rigorous assessment of universities on eight different indicators, including the ratio of faculty to students, the proportion of academic staff with a PhD and the institution’s reputation among academics and employers. QS BRICS University Rankings 2018 assessed thousands of universities in BRICS countries; i.e., Brazil, Russia, India, China and South Africa. “It is a welcome development that KIIT has got a place in the QS BRICS University Rankings through tough completion despite being a young university”, remarked dignitaries, while giving the Ranking Certificate to KIIT on 22nd November in New Delhi. On the other hand, KIIT’s inclusion in the QS ranking reflects high quality academics at the institute. 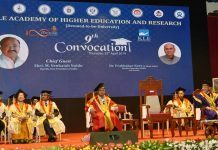 It is a matter of pride for the State of Odisha and will invigorate the technical, professional and higher education in the state, said Prof. Achyuta Samanta, Founder, KIIT & KISS.